Abstract: The goal of the M1-Project is to create a physical and virtual Android Robot which can be programmed to perform the creative behaviors somewhat similar to those in people. The system will have a physical presence. The system must be able to adapt to new situations. It must be able to re-program itself. The Android's Mind must be designed such that given enough time and education it can become an expert in fields of study and get advanced degrees. A balance must be struck between too little initial programming, resulting in decades or centuries of learning, and too much initial programming resulting in too much change required for new learning to occur. The M1 Android Robot Mind Architecture as outlined below is a work in progress. Ten areas have been identified as being significant or helpful in order to program a sentient robot. These ten components will form the foundation of the android's "Mind". It is critical to note that the android's mind is no mere I/O function. The M1 Mind will not be a simplistic "if A then 1, elseif B then 2, ...". Nor will M1 be a simplistic word pattern-matcher. Rather, M1 will consist of a physical presence in a defined dimensional universe and will be heavily oriented toward learning about itself, others, the world and the universe. The ordering is arbitrary in that no particular item is considered of greater importance than any other item. The design of the Temporal Architecture is very simplistic at this point. It will be further refined and detailed in the coming weeks and months. 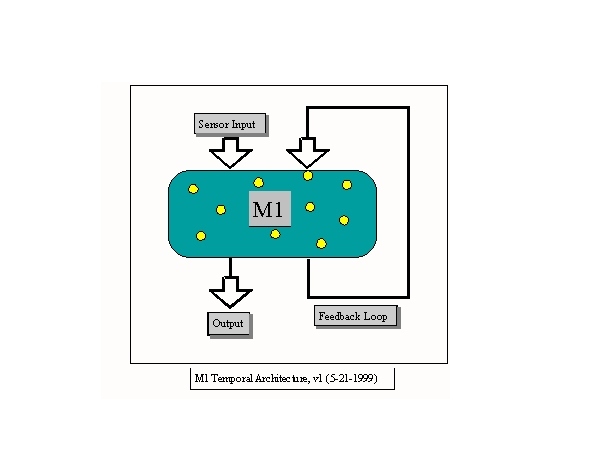 However, there is enough detail even at this early stage to see that the M1 Architecture is no mere I/O function. The Feedback Loop provides a potentially continuous processing mechanism regardless of Sensor Input and Output. ie; The M1 Mind can be functioning and active regardless of any current input and output. These Mind-Casts represent a high-level overview of the categories of behaviour and information processing. I think it's critical to identify and differentiate between these categories of behavior because focusing on only one should prove to be a major complexity reduction when it comes to implementing these. I propose that the Scientific Mind-Cast may be the easiest to implement because there is less randomess to code than in the other mind-casts. The Scientific mind is the epitomy of objectivity, like a finely tuned machine. is in the room when only lifesize picture of a person is present. 100% accurate; only that the Robot act on it's perceived reality. The Robot may ask for help in identifying things and people. 2. The immediate neighborhood which is not I.
I don't think it's absolutely necessary for there to be a physical component for life. technology. Therefore, a physical-based life form will be attempted. Others like "I". The Social-Context is derived from SR.
to predict the reaction of remote minds to stimuli. useful for it to recognize it's own species, and it's creator species. the robot to periodically replenish it's power sources. Three times daily is acceptable. The robot isn't going to be of much practical value if it readily disassembles itself. An aversion (fear-of) to dismemberment will have to be encoded. fully here in the Temporal-Driver. 1. Temporal-Driver (TD) - Responsible for the passage of time. 2. Temporal-Concept - Crystallizing Chronoleum Temporal Dimension prototype-1. 3. Temporal-Cache - Recent events Cache. concepts, and the continuity of Focus. 3. Continuity of Focus over time. could live in a black box. A very brilliant person invented this black-box system. Unfortunately, this person didn't himself provide an implementation using this system. of complexity more complex than a simple chronometer. The system to process analogies. 1. Discrete objects and activities, both physical and temporal. 2. Continuous objects and activities, both physical and temporal. 3. Collections of Discrete and Continuous entities. 2. Near-Trigger - As opposed to Far. 3. Far-Trigger - As opposed to Near. 4. Range-Trigger - Depth Trigger. 6. Leaf - Find the leaves. 7. T(x) - Arbitrary trigger functions. implement several Mind-Casts, further simplifying the task. 1. Mind-Cast Categories with a sampling of some properties. 5. Business - Profit, wealth, material, money, greed, transactions, marketing, commerce, labor. 6. Art - Subjectivity, appearance, creativity, originality, imprecision, entertainment, authoring. others think and are doing is of supreme importance. 9. Self - I, me, yo, self-ish, the center of the universe is ME. 10. Partner - Significant other, extended self, family. information below is preliminary and subject to revision. 1. Give Things A Name (GTAN) - Give things a name or find the name of things. things. Consider the system's state when the values of the variables are changed. 1. Generalize-Categorize (GC) - The more general category. 2. Specialize-Instantiate (SI) - The more specific example. from how to achieve it or how it will come about. 6. Ways of Choosing (WC) - A system for making choices. 1. Does the choice have to be correct? Does a wrong choice exist? 2. Is this a Defining choice? Is any choice okay? 3. Is there a set or range(es) to choose from? 7. Cause and Effect modeling. observed that not all of the domain of behaviours are worth modeling. enable or encourage the human way of thought. 2. Visitor - Visits concepts. 2. Analogy-Enabler Architecture prototype-1. System requirements are below. 2. Robust - Tried and proven technology. 3. Browseable Offline and Online mode. 4. Reconfigurable Online and Offline. 1. Short-range extended proximity sensors (aka hair). 2. Perimeter sensors - skin. 6. Balance - Gravitic/Inertial UP-vector stabilizer. 7. Motor Control - The control of the robot's moving parts and other hardware features. buttons for skin, and gyroscopes will have to suffice for Sensory I/O. incorrectly that a skinned robot is more advanced than a metal or plastic framed robot. reasons why Skin isn't superior to durable metal: durability for one. What I'm doing. The root of sentience. *****. This module will be implemented as the Minds-Eye (ME) prototype. 1. Internal language-independent representation of concepts. ABC. Rough outline and examples below. This layer is to be implemented in M2. 1. A robot must not harm a human being, nor through inaction allow a human to come to harm. 2. A robot must do what it's told by a human being, except where that would conflict with law 1. 3. A robot must protect itself, except where that would conflict with laws 1 and 2.